- Rolling Resistance: The patented, 5 mm thick SmartGuard layer, when compared to all generic products, has a significant advantage in rolling resistance. 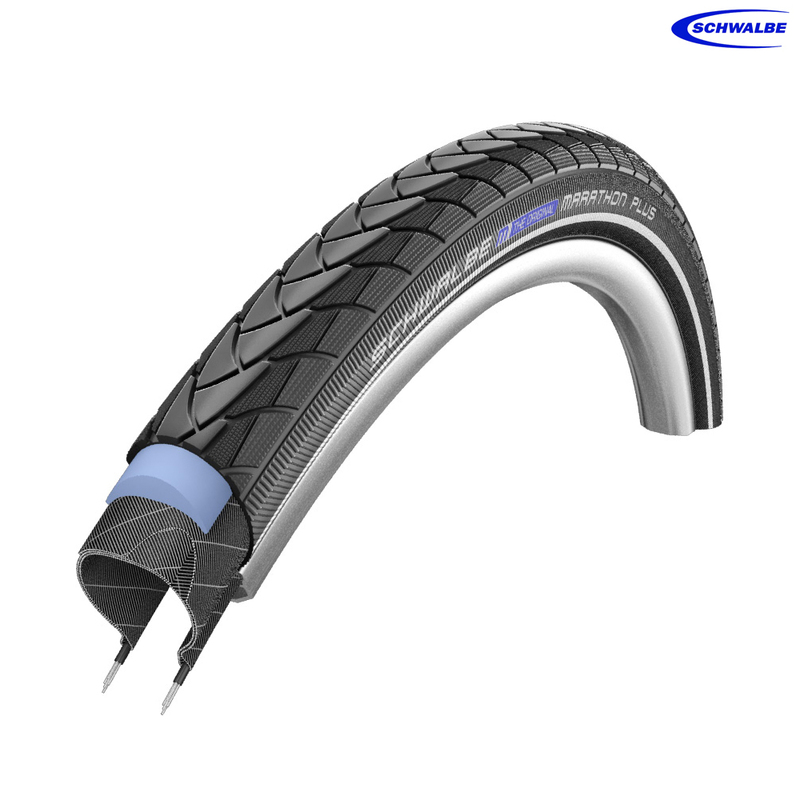 Schwalbe futher extended its lead in the latest version. - Recycling: Also in the SmartGuard, Schwalbe now use a proportion of recycled rubber from old latex products. - "Anti-Aging" Side Wall: It now lasts much longer before developing unsightly cracks when subjected to use with too low air pressure. - E-Bike Ready: The main sizes are approved and tested for E-Bikes up to 50km/h. Following sizes carry the ECE-R75 mark: 47-406, 47-559, 37-622, 40-622, 47-622. I’ve got these tyres on other bikes and they’re great. Reliable, long lasting and very puncture resistant. Of course any tyre can get a puncture, but these tyres drastically reduce that probability. Brilliant for both Road and track such as towpaths, gravel paths etc. Highly recommended, likewise with SJS service - first class as always. Yes, as they are only 2mm slimmer. between the Marathon Plus 700x35C HS348, that I currently have fitted, and the Marathon Plus 700x35C HS440 currently available? The HS440 is the most current model. Referring back to my previous question, sorry you are right, I got my sizes wrong. I do have some 700 x 34c (37-622) Marathon Plus HS348 tires on my bike currently, but my previous tires were 700 x 38c (40-622). Both these sizes seemed to fit fine on my Mavic A319 wheels, but would you recommend one size over the other? Or even a different size to either of these? The wider tyre will give you the ability to run a lower tyre pressure to gain more comfort and more grip. The slimmer tyre may feel like it rolls faster due to less rolling contact with the riding surface.It depends on the use of the bicycle, for example if your were to be carrying large amounts of load or taking the bicycle on rougher trails I would suggest the 38mm tyres may suit better. Tyre width is generally personal choice! I currently have some Marathon Plus HS348 tires on my hybrid bike which has Mavic A319 wheels, however I've borrowed the tires from someone and now need to buy my own. The tires I have on at the moment are 700 x 34c (37-622) and have been working fine, but would you recommend another size over this one? I'm asking because the original tires that came with my bike (which I bought second hand) were 26 x 2.1 (54-559) and also fitted fine. Also my current Marathon Plus tires seem to have inner tubes that you can't separate from the tire, is this the case with the Marathon Plus tires you sell here? The two sizes of tires quoted are quite different and simply they will not both fit onto the same wheel. Unless you are using different wheels then tyre sizing will need to be confirmed. Sometimes with time and high pressures the two rubber surfaces can become quite well stuck together and just need pulling apart. Currently I have a Continental Ultra Sport 700 X 25 on my rear wheel. Would this tire be significantly higher than than the one on my bike? Can I Replace 700Cx40 Tyres With 700Cx45? Hi yes if you have enough frame and mudguard clearance.